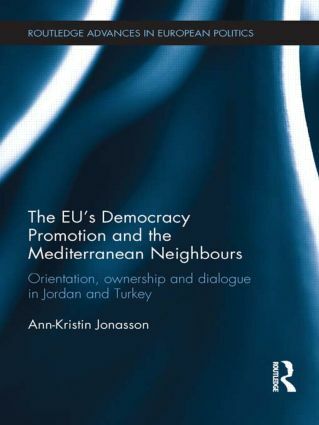 This book provides a systematic analysis of the EU’s extensive, but so far largely failed, efforts to promote democracy in the Mediterranean region, thoroughly assessing its democracy promotion in relation to two Mediterranean countries – Jordan and Turkey. By pinpointing essential prerequisites for democracy promotion and analyzing how the EU’s policies have related to these, the author offers a theoretically based analytical framework focused on the importance of the local orientation and ownership of the project of democratization, and the broader dialogue between the democracy promoter and the partner society. The author concludes that there are basic deficiencies in the EU’s democracy promotion, leading to policy implications of vital importance as the EU now grapples with how to make its democracy promotion successful. The EU’s Democracy Promotion and the Mediterranean Neighbours will be of interest to students and scholars of Democratisation studies, EU studies, Middle East Studies and EU Neighbourhood studies. Ann-Kristin Jonasson is a senior lecturer in the Department of Political Science at the University of Gothenburg, Sweden.